What was it that was different about producer Judah Raymond so that when he kissed her, Amy felt shaken and moved in a way she never felt before? Who does producer Judah Raymond remind you of? I can’t quite place him. He’s like equal parts Burt Reynolds and John Astin, with a little Jack Cassidy circa The Eiger Sanction . He also looks like about 90% of the guys who Danno booked. Maria is our resident Hawaii Five-O scholar. Maybe she can help. She thought of herself only as a dedicated nurse until she learned she was also a woman. “Your reasons for coming to Shellville are your own affair and I have no desire to know them,” Nurse Nora Courtney told the new young doctor — but she knew she lied both to him and to herself. Everything about Doctor Owen Baird interested her for she knew she was hopelessly and passionately in love with him. And when beautiful Lillian Halstead set her cap for the young doctor, Nora realized she must make him see her as a desirable woman as well as an efficient nurse. How Nora achieved her purpose and what these three handsome young people made of their lives is thrilling reading, growing to an unexpected and satisfying climax. Oh, man! They gave away the ending! One of the things I love about career romance fiction is that you never know how things are going to turn out. 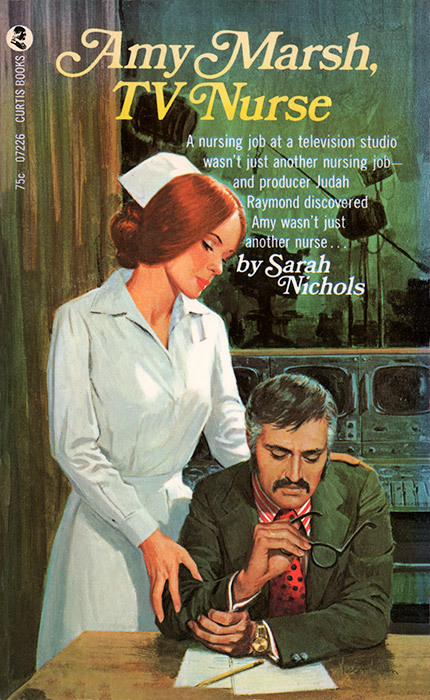 Will Nurse Nora find fulfillment in her health services career? Will she listen to her heart and be swept up in a whirlwind workplace romance with Dr. Baird that may or may not violate the terms and conditions of her employment and certainly runs contrary to the latest guidelines on sexual harassment laid out by the Equal Employment Opportunity Commission? Normally, there would be no possible way for you to know the answers to those questions until the very last pages of the book, and it is that delicious unpredictability that elevates career romance fiction above other so-called literary works. 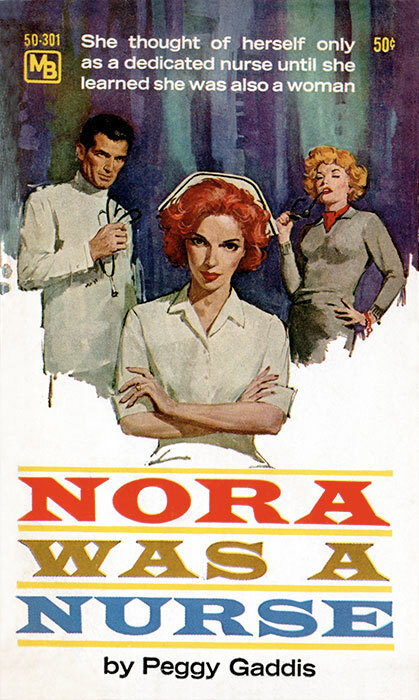 So, how can this book claim to “grow to an unexpected and satisfying climax” [emphasis mine] when the synposis clearly states that Nurse Nora “achieve[s] her purpose” in the end? Did they not have SPOILER ALERTs in 1953? …I would have thought the bust was a dead giveaway. Did she not notice that her stethoscope didn’t hang straight? Editor’s Note: The scanned image is an accurate representation of the book cover itself. If the type appears to be slightly askew, that’s because it is. It is not the fault of the scanning hardware or its operator (this time). 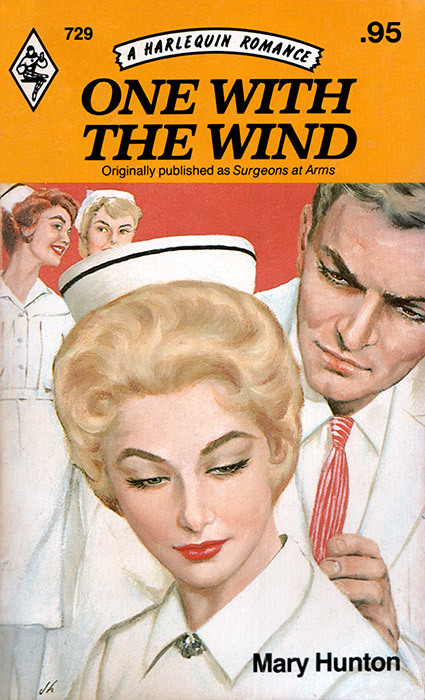 Hilary wondered which was the real John Kirkall–the ambitious, apparently unfeeling surgeon who plagued her during working hours, or the hesitant man who showed occasional signs of having a heart. Not that she was ever likely to find out. She knew that her place in his esteem had hit rock bottom. Originally published as Surgeons at Arms . Dr. Kirkall also showed occasional signs of wearing mascara. And you just know those two in the background are going to be nothing but trouble.